A member of the chemistry faculty since 2007, Carlos Crespo-Hernández has made discoveries with wide-ranging applications. In addition to the recognition he has won for his research, he received the John S. Diekhoff Award for Distinguished Graduate Student Teaching in 2016. Photo by Mike Sands. During her sophomore year at Case Western Reserve, biology major Briana Sealey (CWR ’17) hit a wall. A first-generation college student from Berea, Ohio, she found herself overwhelmed by the challenges of university life. “I considered giving up and never getting out of bed again,” she says. But Sealey had a resource that undergraduates in her situation often lack: a strong mentoring relationship with a faculty member. While still in high school, she had spent two summers working in the lab of Carlos Crespo-Hernández, an associate professor in the Department of Chemistry who co-directs the university’s Center for Chemical Dynamics. Crespo-Hernández provides hands-on research experience to economically disadvantaged and underrepresented students through Project SEED, a nationwide initiative funded by the American Chemical Society. When Sealey reached out to him, he was able to offer her the encouragement and guidance she needed. The shining light metaphor may be especially apt in Crespo-Hernández’ case. He specializes in photochemistry, a field concerned with the chemical effects of light. Since many chemical reactions are driven by the energy transmitted through light, photochemistry covers a lot of ground—and so does Crespo-Hernández. Among other things, he has sought to understand how environmental pollutants break down when exposed to sunlight; how ultraviolet radiation affects DNA; and how his own discoveries can be leveraged to develop safer drugs and new anticancer agents. What’s more, light itself is one of the most important tools he uses in his work. Early in his career, as a postdoctoral fellow at The Ohio State University, Crespo-Hernández was introduced to a technique known as ultrafast spectroscopy. “Ultrafast” is a virtue in photochemistry because chemical reactions occur very quickly. When exposed to light, for example, some of the proteins in the retinas of your eyes undergo chemical changes in just a few picoseconds, or trillionths of a second. To understand such reactions, and then to exploit or manipulate them to our benefit, researchers must observe how they unfold. Ultrafast spectroscopy allows Crespo-Hernández to do just that. Like an old-fashioned stroboscopic photograph that captures an image of a bullet in mid-flight with a high-speed flash, ultrafast spectroscopy uses rapid pulses of laser light to take snapshots of chemical reactions at timescales that can be difficult to imagine. Crespo-Hernández primarily applies one modality of the technique, transient absorption spectroscopy, to observe changes in the electronic states of molecules at a timescale of femtoseconds, or quadrillionths of a second. In his experiments, Crespo-Hernández excites the molecules in whatever sample he wishes to study (a bit of DNA, a smidgen of pollutant, a chemical used in solar cells) by unleashing an initial pulse of laser light that boosts the molecules from one electronic energy state to another. With a second pulse, he identifies the distinctive set of wavelengths that the molecules absorb at each electronic state—their absorption spectra. As he explains, every molecule has a characteristic spectral signature at every conceivable energy state, generated by its unique electronic and nuclear configuration. By assembling a series of spectral snapshots, Crespo-Hernández can produce what amounts to a movie of molecular behavior in real time. Such movies, however, do not tell a straightforward story. To interpret them, Crespo-Hernández must perform a complex series of calculations and compare his experimental data with the numbers generated by sophisticated computational models. Only then can he be confident that he understands how the electronic states in these materials are evolving femtosecond by femtosecond. It’s challenging, rigorous work, and it helped earn Crespo-Hernández a Faculty Early Career Development (CAREER) Award from the National Science Foundation in 2013. By combining cutting-edge experimental methods with advanced theoretical and computational approaches, he and his colleagues have made fundamental scientific discoveries with wide-ranging applications—and have even shed light on the very origins of life. Crespo-Hernández’s own origins were modest. Born and raised in Lares, a small agricultural town in Puerto Rico’s mountainous interior, he grew up fascinated by nature and mathematics. 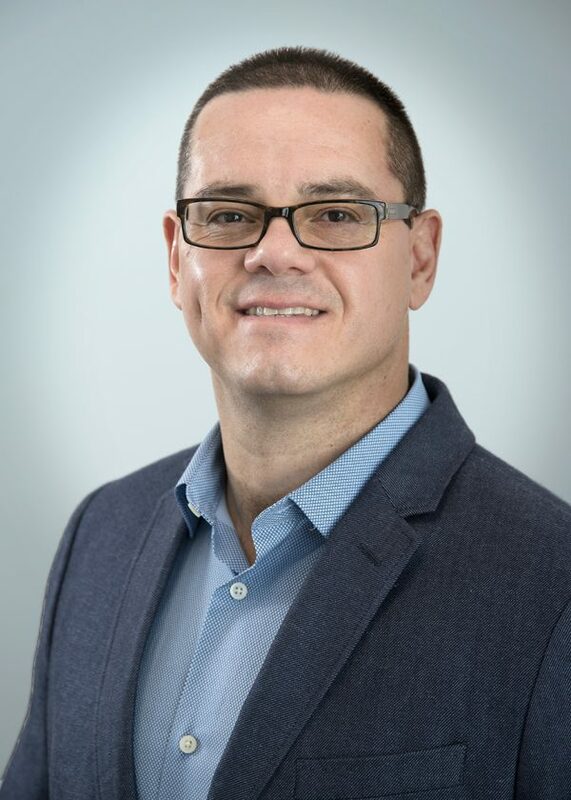 The only scientific role model at hand, however, was a local doctor, and so it was as an aspiring physician that Crespo-Hernández enrolled at the University of Puerto Rico, Río Piedras Campus (UPR-RP), in San Juan. Though he had no background in the subject, he decided to major in chemistry and soon developed a passion for research. He also put in a tremendous effort, not least because his textbooks were in English, a language he barely spoke. “I literally had to translate my science books from English to Spanish,” he recalls. After completing his bachelor’s degree, Crespo-Hernández went on to earn a doctorate in physical chemistry from UPR-RP. A National Science Foundation Graduate Teaching Fellowship in K-12 education sent him to schools across northeastern Puerto Rico, modeling active-learning educational techniques and teaching fundamental concepts in science to students and teachers alike. He then spent four years at Ohio State, first as a National Institutes of Health Postdoctoral Fellow and then as a research associate. There he contributed to studies showing for the first time exactly how DNA avoids damage when exposed to ultraviolet radiation―breakthroughs that were published in influential scientific journals such as Nature and Science. In 2007, when Crespo-Hernández joined the chemistry faculty at Case Western Reserve, he continued his work on DNA and soon made a surprising discovery—one whose implications he continues to investigate to this day. One of the most intriguing aspects of DNA, at least from a photochemical perspective, is its extraordinary stability. When DNA molecules are excited by ultraviolet radiation into high-energy electronic states, they can become intensely reactive, increasing the likelihood of damage or mutations. This is especially true for a small subset of molecules that can transition to a quantum state known as a triplet state. But in most cases, DNA molecules rapidly dissipate the excess electronic energy as heat and quickly return to a less reactive electronic state known as the ground state. Crespo-Hernández likens this property to a kind of natural sunblock, and suggests that it may be among the reasons why nature selected DNA as the basis for life on Earth. A tiny fraction of excited DNA molecules, however, may fail to return to the ground state. This failure can result in damage to the DNA, which can eventually lead to skin cancer and other serious ailments. 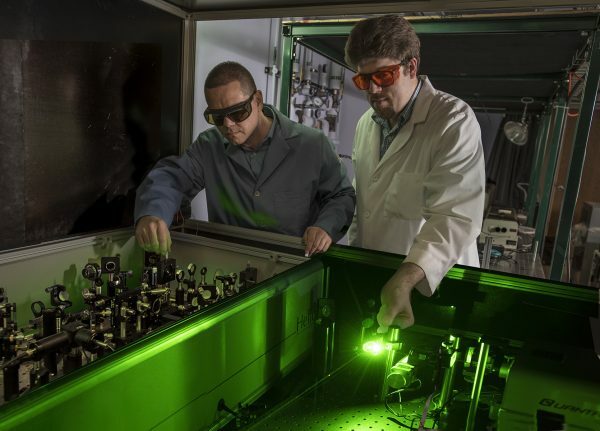 From left: Crespo-Hernández and doctoral student Matthew Brister use pulses of laser light to excite electrons in a sample—a bit of DNA, for example. Some of this research has yielded clues to the chemical origins of life. Photo by Mike Sands. Because so few naturally occurring DNA molecules transition to the triplet state, it is difficult to study. So Crespo-Hernández began experimenting with ways of encouraging excited DNA molecules to enter this state more easily, and to stay there longer. Initially, he took a molecule called thymine—one of the organic molecules, called nucleic acid bases, that serve as the building blocks of DNA—and replaced one of its oxygen atoms with a sulfur atom. Such sulfur-substituted molecules are known as thiobases, from the Greek theion, for “sulfur.” There are many varieties—some natural, some manmade. The one that Crespo-Hernández investigated in his lab was far more likely than thymine to enter and remain trapped in its triplet state when excited by light. In fact, its eagerness to do so exceeded Crespo-Hernández’s wildest expectations. Nearly 100 percent of his modified thymine molecules made the transition, and with astonishing speed—all in apparent contradiction to the laws of quantum mechanics, which govern the dynamics of matter at the smallest scales. Since his initial discovery, Crespo-Hernández and his group have observed the same phenomenon in a large number of thiobases and their derivatives, including sulfur-substituted cytosine, guanine and uracil—three other nucleic acid bases. Crespo-Hernández immediately set about using ultrafast spectroscopy, quantum chemistry and computational modeling to understand how and why the thiobases were able to perform these blindingly fast and efficient leaps into their triplet state, a process known in the trade as ultrafast intersystem crossing. (A paper he published last year with colleagues in Vienna and Madrid in Nature Communications provides the most complete explanation of the phenomenon to date.) At the same time, Crespo-Hernández began to explore ways of putting his newfound knowledge of thiobases to good use. Other scientists, including George H. Hitchings, a CWRU biochemist and co-recipient of the 1988 Nobel Prize in Physiology or Medicine, had already developed clinical applications for some of these thiobases, including a guanine derivative known as 6-thioguanine (6TG). 6TG and some of its derivatives are widely employed as anticancer drugs, or as immunosuppressants to facilitate organ transplants and manage inflammatory diseases like irritable bowel syndrome. These applications do not depend on the molecules’ light sensitivity, but rather on other biochemical properties. Because 6TG and its derivatives are so similar to the naturally occurring guanine base, they are readily metabolized by enzymes in a patient’s cells and incorporated into the cells’ DNA—a characteristic that enhances their value as therapeutic agents. But their inherent reactivity to sunlight has an unfortunate side effect: When they become part of the DNA in skin cells, the patient’s risk of skin cancer increases up to 200-fold. With his research group, Crespo-Hernández began to investigate the mechanism by which the incorporation of 6TG into DNA damages skin cells, and to search for new thiobases that are potentially less phototoxic than the ones currently in use. But he also realized that the light-activated toxicity of these molecules could be exploited to fight disease. In collaboration with the Department of Dermatology in the CWRU School of Medicine, for instance, he has demonstrated that several sulfur-substituted molecules can be used to selectively kill skin cancer cells. Because malignant cells proliferate thousands of times more rapidly than normal ones, they are even more likely to incorporate light-sensitive synthetic bases into their DNA. Crespo-Hernández showed that once this occurs in skin cancer cells, it is possible to decrease their proliferation significantly by exposing them to light of a specific wavelength—in this case, near-visible laser light that can penetrate the epidermal and dermal layers of the skin. The advantage of this treatment is that, unlike other cancer therapies, it is highly selective, leaving healthy cells mostly unharmed. Crespo-Hernández recently discovered several new thiobases that are even better suited to such phototherapeutic applications. He now hopes to develop one activated by longer wavelengths of light that can penetrate even deeper into the body, reaching tumors in internal organs such as the kidneys. Billions of years ago, during what scientists call the prebiotic era—long before there were plants and animals, or even single-celled organisms—thiobases and other complex organic molecules began to form in Earth’s oceans, which in the absence of an ozone layer were bombarded by powerful ultraviolet rays. Crespo-Hernández and two of his graduate students, Matthew Brister and Marvin Pollum (GRS ’16), have explored the possible role that some of these substances may have played in the chemical origins of RNA and DNA—and hence of life as we know it today. To Crespo-Hernández, his various research projects have a common thread: “It’s all about the fundamental understanding of the interaction of light with matter,” he says. Similarly, his work with students in Project SEED is of a piece with other outreach activities, all motivated by his determination to help members of historically underrepresented and economically disadvantaged groups build careers in science and technology. It was the same message he conveyed to Briana Sealey, who graduated in May and will enter the Frontiers Master’s Program in Ecology and Evolutionary Biology at the University of Michigan this fall. 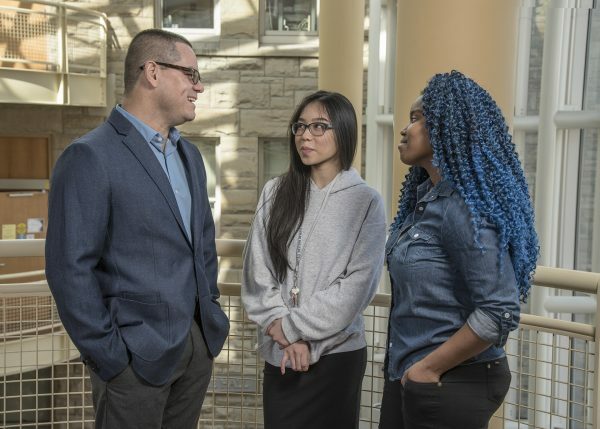 From left: Crespo-Hernández was a research mentor to Jessica Pham and Briana Sealey while they were still in high school. Pham has now completed her first year as a pre-med student at CWRU, and Sealey graduated this May with a bachelor’s degree in biology. Photo by Mike Sands. Carlos Crespo-Hernández brought Project SEED to Case Western Reserve for the first time in 2010. Since then, 34 high school students selected as SEED Fellows have conducted chemistry experiments in more than 10 different university labs, working alongside undergraduate and graduate students during the summer and presenting their findings at a public forum. They have also received individual mentoring from faculty members, as well as letters of recommendation for college and the opportunity to win a SEED scholarship. More than 80 percent of these students are currently pursuing or planning to pursue science education in college―a major goal of the program. Over the years, SEED students have contributed to some of Crespo-Hernández’ most important projects. In summer 2012, for example, Briana Sealey, then a rising senior at Berea High School, helped investigate a class of common environmental pollutants called nitro-polycyclic aromatic hydrocarbons, or NPAHs. NPAHs are carcinogens found in everything from diesel fumes to grilled foods. Sunlight breaks them down, but that process generates a variety of other chemical products—some of which are even more toxic than the NPAHs themselves, and many of which are unknown. By studying the reactions involved and determining what exactly NPAHs turn into, Crespo-Hernández hopes to mitigate their impact and help governments develop more informed regulatory policies. To advance this research, Sealey worked with doctoral student R. Aaron Vogt (GRS ’12) to simulate the degradation of NPAHs by sunlight and analyze the results. She later co-authored an article with Crespo-Hernández and Vogt for the journal Modern Chemistry & Applications. A more recent SEED Fellow, pre-med student Jessica Pham, was a rising senior at the Cleveland School of Science and Medicine (CSSM) when she joined Crespo-Hernández’ lab in summer 2014. For her project, she compared the ultraviolet absorption spectra of various thiobases, seeking to identify ones that would be less harmful to patients than those currently in use as anticancer drugs and immunosuppressants. Pham, who has since become the first in her family to attend college, felt somewhat out of place on her initial visit to campus for Project SEED. Like Crespo-Hernández, however, she quickly discovered a passion for research. Even before she finished high school, her experience in his lab led to other research positions at Case Western Reserve. And last year, after graduating from CSSM, Pham entered the university with a full scholarship from the Joan C. Edwards Charitable Foundation—an award that will fund not only her undergraduate studies but also her medical school education at CWRU. “I owe most of my success to SEED,” she says.